Finding the best bubble level doesn’t have to be an exercise in frustration in spite of the vast number of options out there. In general, there are plenty of reputable choices. Sometimes, you just need to know what other Pros are using to validate your thoughts. Known also as a spirit level, here are some of the most popular models along with some things to look out for. Editor’s note: This article originally published on January 29, 2018. Accuracy – a bubble level is only as good as its ability to give you a truly level measurement. We prefer to use levels with 0.0005″/1″ accuracy or better. On a 48″ level, that gives us a maximum error of +/- 0.024″, or 3/125″. However, less expensive and smaller levels like torpedo and pocket models often fall short of that mark. Visibility – the most accurate bubble level in the world doesn’t mean diddly if you can’t see the bubble. Different colors and high contrast help a lot. Durability – bubble levels do most of their work on jobsites where the environment isn’t as forgiving as the living room where you’re trying to hang a picture. You’ll want to avoid plastic. Magnetic – magnets are great for acting as a third hand when you’re working around steel. LED lights – battery-powered lights really help the visibility of a spirit level when you’re working in low light or varying light conditions. 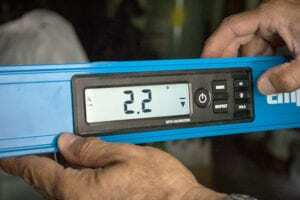 Digital levels – some Pros enjoy the convenience of a digital readout rather than just a vial, especially when you’re working toward specific grades like on wheelchair ramps. There are only a few players in the premium level class and our favorite is the Milwaukee Redstick level. Their Sharpsite vials give the level Excellent visibility compared to standard vials. But it’s what you can’t see that sets it apart – an all-metal backbone. The backbone has multiple ridges moving along the interior of the box that gives it Outstanding durability compared to other box levels. There’s no compromise in accuracy with an Excellent 0.0005″ rating. Like its competitors in the class, the additional innovations also drive up the price. Fortunately, you can grab a case to protect your level and there are also multiple level sets in the Redstick line to help save some money if you need more than one size. If you’re willing to give a little on visibility and strength, a standard box level is where you turn. For a 48″ model, you’re looking closer to the $50 range. In this class, we turn to Empire Level and their True Blue vials. The blue coloration gives you a bit better visibility than standard yellow vials and their levels are pretty tough. Bump up in price point another $10, and you’ll get even better visibility with Empire’s UltraView LED lights on your level. For the 48″ class, we recommend going with the em95.48 to get you Excellent accuracy and durability with Outstanding visibility. I-beam levels don’t have the same durability as a box level, but they’re less expensive and lighter weight. Case in point: Empire’s e55 series. For $49.99, you get the same Excellent visibility and accuracy as Empire’s standard box levels, but you get a 72″ model instead of 48″. Sticking with the popular 48″ size drops the price down to $29.99. The trade-off is moving down a notch to Very Good durability. For the budget-minded Pro, you might have to give up a little accuracy. That’s the case with Stanley’s 42-480. You get Good durability with lightweight aluminum construction and protective end caps. The traditional three vial system gives you Good accuracy at 0.0015″ and visibility is Good as well. There’s also a groove for working on pipe. What sets this level apart for us is that it’s only $13.59 – pretty much a steal for a Pro level. You typically store torpedo levels in one of two places during the workday: your tool pouch or your pocket. We love that Klein’s 935RBLT torpedo level has an angled nose to help it slide into both more easily. Aside from that, Klein gives you level, plumb, and 45° vials with LED lights for low light situations. And since this is a go-to tool for plumbers and electricians, those low light jobs are more frequent than many other trades. There’s also a V-groove cut into the top to ensure you can work with pipe easily and magnets for work around steel. The Klein Lighted Torpedo Billet Level gives you Excellent durability, Outstanding visibility, and Very Good accuracy. If you don’t need the 45° vial, go for Empire Level’s em 95.10 torpedo level. You get Excellent accuracy at 0.0005″, which is an improvement over Klein’s 0.001″, along with Very Good durability and Outstanding visibility. Pocket levels are great for quick checks or work in really tight spaces, but the single vial system has some significant limitations. Milwaukee’s pocket level handles that with a rotating, lockable vial. You can dial in a specific angle working in 2° increments or find the common angles of 15°, 22.5°, 45°. and 75° on the opposite side of the dial. You get Excellent durability, Very Good visibility, and Good accuracy in this small package. If you can forgo the rotating dial, Kapro has a compelling model in the Optivision lineup. The 946 Smarty uses a white frame with a red vial housing to give the bubble a high-contrast red border that shows up well against the white. Of the non-LED models we use, it has the most visible vial. Marks of 1% and 2% help double check installation gradients and there’s a magnetic holder that clips to your belt, helping keep it close at hand. You get Excellent accuracy, visibility, and durability. Mason’s levels have to be tougher than most. It’s not just the concrete, it’s the way masons tap them to level brick and block during construction. For a basic mason’s level that’s flat-out tough, check out Kapro’s 930 SmartCast. It’s a cast aluminum non-standard I-beam style that gives you gradient measurements up to 2° and has rubber strike pads on each end. Excellent visibility, durability, and accuracy give masons confidence in their work. Moving toward the box level side along with impressive looks is Ox Tools’ Bamboo mason’s level. Yes, bamboo. 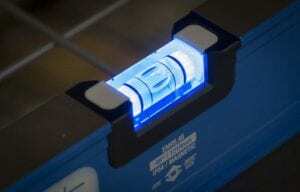 It offers Excellent strength over hollow box levels and looks good while it’s working. Accuracy slips just a hair to 0.00075″ to earn a Very Good rating to go along with Good visibility on the vials. Some mason’s levels move beyond simply checking for level construction and taking some trowel tapping abuse. 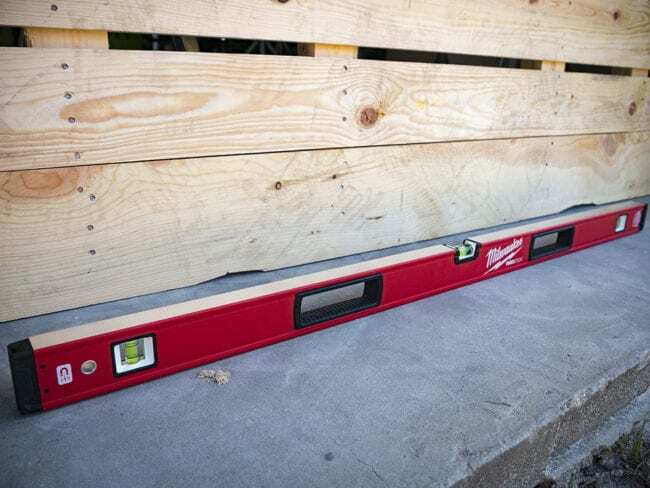 Milwaukee’s Redstick concrete level lets you take care of screeding and smoothing duties. The square edge on the base acts as your screed while the round edge lets you smooth concrete. Milwaukee also designed this level with materials that easily clean at the end of the day – or even the next day. Sharpsite vials give you Excellent visibility to see level, 1/8″, or 1/4″ grades. The construction gives you Excellent durability and accuracy at 0.0005″. If you’re one of the Pros looking to make the jump to digital levels, you’ll love Empire Level’s em105.95 (or e105.95 if you don’t want the magnets). Moving from $60 standard box levels to the $170 price point is what it will take. You maintain Empire’s Excellent accuracy with a digital readout. The best part is that it’s an auto-calibrating system – just turn it on and get to work. Dual digital displays are backlit to all but negate the need for checking bubbles. However, batteries die and you can rely on Empire’s Excellent visibility with standard level and plumb vials if you need to. Wrapped in an IP65 rated housing with Excellent durability, this is our favorite digital level to turn to. Bubble levels have been around for a long time. Even though cross line lasers are a sexier option, the bubble level still trumps them in several areas. Lasers lose visibility as soon as you step into the light, limiting their usefulness outside. And while a laser is more accurate, it’s better for longer distances than what you’ll use a spirit level for. There’s also the convenience factor – you usually go for your spirit level when you’re making frequent checks for level and plumb work. Cross line lasers take more time to set up. There is a wide range of classes for levels out there. Admittedly, we didn’t cover every single option (post levels, for example). To make our list, each level had to hit our base accuracy standard of 0.005″/1″ (1/2000″), have high visibility, and a durable metal construction. See Some Brands that are Missing? We reached out to more manufacturers than are represented here, but some declined to participate even though they make excellent bubble levels. That’s okay! We know personal preferences take a front seat in determining the best spirit level for you, and every Pro is different. 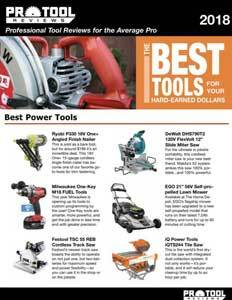 Do Pro Tool Nation a favor and tell us what your top pick is and why you love it. Feel free to put it in the comments below or on Facebook, Instagram, and Twitter! All great levels i must say…Great Quality, Great Accuracy but ALL way over priced…I have found that many levels that are not national brands are just as reliable and equally accurate. Provided they are used properly and well taken care of! Folks the best levels out there are Stabila and Sola. You willnt find them at the big box stores.Maybe thats why theyre not in this review? Hopefully Sola, Stabila and BMI will participate next time. Bought the Empire DIgital level and had to go through 2 before I got one that did not have the top vial popping out of the housing. And I did have to manually calibrate the unit as the digital display did not agree with the spirit level. Once dialed in, the unit works great and is typically overkill when measuring in hundreths of an inch, but what the heck, if you got it, use it and go for 100% accuracy in your work.